Having failed to make progress from the qualifying rounds in 1896/7 it is not surprising that Woolwich Arsenal were told to qualify again in 1897/8. 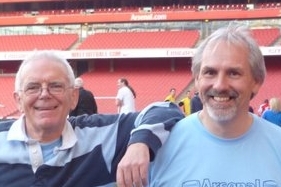 This time the rounds avoided the “Final Supplementary Round” and Arsenal entered in the 3rd qualifying round, knowing that three victories would get them through. It appears that this club has no link with the current St Albans City, and certainly none with the most St Albans Rangers. In 1897 the club joined the Southern League Second Division and ended up mid-table, with nine wins and eight defeats. The following season the second division of the league split into a London section and south-west section, and St Albans played in the former, again securing a mid-table position. 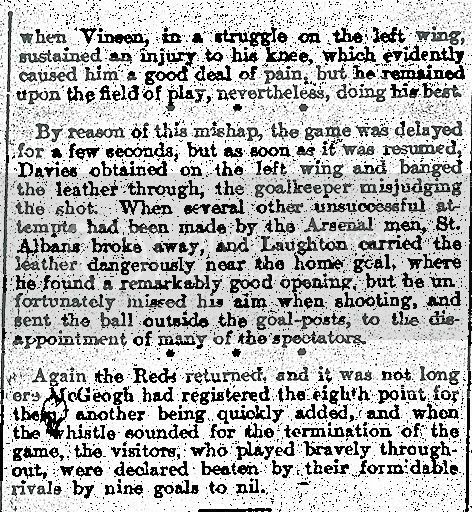 But that was it – from there on there is no record – they were not only not in the second division of the Southern League (which in 1899 reformed into one league again) but neither did they appear to be anywhere else. They seem to have stopped. Sheppy United arose from clubs that were formed in 1886 the same year as Arsenal and the story of their history is recorded on their web site. The actual Sheppy United arose four years later. Sheppy were another Southern League club joined the second division of the league when it started in 1894, being runners up that year. They played a “test match” to see who went up, but lost to Clapton. The following season however they were again second, and this time went up, defeating Royal Ordnance Factories 4-2 – the club that broke away from Woolwich Arsenal FC upon the move towards professionalism. In 1896/7 they struggled in the first division of the Southern League but avoided relegation in the test matches and in 1897/8 they had a solid mid-table season. New Brompton is the club that today we know as Gillingham. They were formed at a meeting, in May 1893 and those who founded the club had the foresight to buy the land that later became Priestfield Stadium. The club’s first match was on 2 September 1893, losing 1–5 to Woolwich Arsenal Reserves in front of a crowd of 2,000. They like Sheppy were founders of the Southern League division two, and were champions in the first season, playing 11 losing one. By 1897 they were still in division one and ended up mid-table that season. So for the second time in three years (two out of two if you just count the qualification years) Arsenal were away to Burnley, and yet again failed to get past the first round proper in the FA Cup. This was not a particularly good season to meet Burnley, who were at this time in the same division as Woolwich Arsenal. Burnley ended the season as second division champions in the Football League, and along with Newcastle were promoted. That season they played 30 league games, won 20, drew 8 and lost 2. They also managed to score 80 goals in those 30 games. Here is a report for the St Albans game. It is from wahtever the local paper for St Albans was at the time.